I have recently found photography, so to speak. Not in regards to my own picture taking skills, as they are far from extraordinary, but I have really grown an appreciation for a beautiful shot (since I know how difficult they can be to capture). But, besides all the different techniques that I will probably never master, there is one thing I struggle with on a day-to-day basis: the lack of a fashionable carrying bag. If you're not quivering at the below options (obviously above the line) then I don't know what to say, except you should stop reading now. This may seem like a silly issue to have, but seriously try fitting a Canon Rebel T3i in a clutch! When are designers going to realize that bulky cameras are a norm now, and there is a need for a more appealing, safe, and functional bag. I am in the process of planning a fairly extensive trip and not taking my camera is simply not an option. 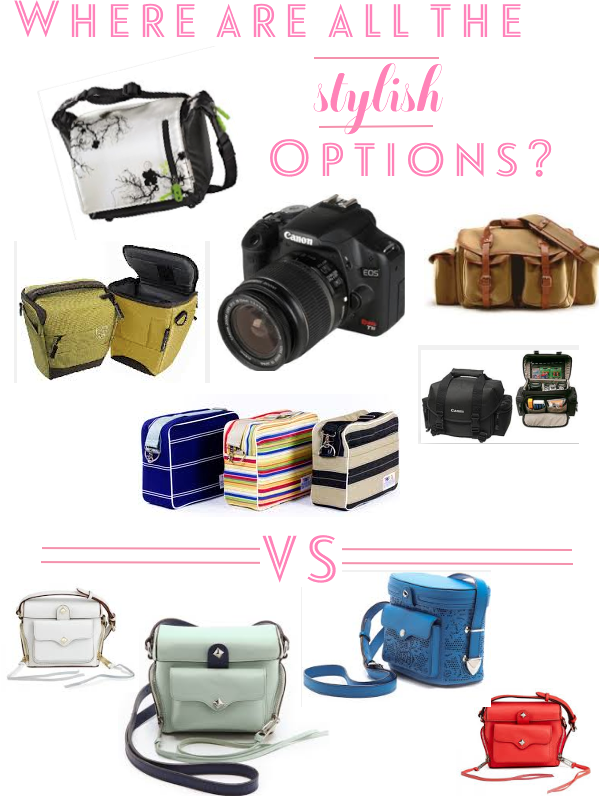 But are my options really to sling it over my shoulder alongside my cross body for all to see? Or, should I continue with my current method of suffocating my camera in a large bag with shirts, scarves, and any other make-shift protective gear I can find? With my collection of mini bags growing rapidly, and the convenience of travelling with few items, something tells me I am more likely to go with the first option. You're probably thinking "didn't Rebecca Minkoff come out with a stylish camera bag?" and yes, she in fact came out with two. After measuring the dimensions of my camera for the umpteenth time I concluded that sadly it will not fit in the Craig Camera Bag (and unfortunately her slightly bigger Collin Camera Bag is not in my travel budget). So, until we see more stylish and fashionable camera bags, I would love to know- how do you carry around your digital SLR? Do you have any travelling-with-a-bulky-camera tips? Story of my life. I'm leaving Monday and I don't even know what I'm going to carry mine in yet!!! A lot of helpful information. As a total newbie to the world of DSLRs and travel photography, I’m always looking for ways to improve my shots.